21 years ago, a renowned South African chef travelled through the narrow pathways of Marrakesh and was inspired by the irresistible mounds of nougat on offer. Upon returning from her travels, Sally Williams put all her time into mastering the flavours and art of creating the world’s ultimate nougat. This is the delicious and indulgent Sally Williams nougat we have come to know and love. It was in 1997, in Sally’s Johannesburg Kitchen that this indulgent confectionery brand was born. Today, the love for Sally Williams has spread to over 20 countries including the US, Australia, UK and Dubai. The finest local ingredients including un-adulterated pure South African honey and export quality macadamia nuts can attest to the quality of Sally Williams nougat. The range of products are handcrafted in small batches with enormous attention to detail in creating the world’s finest honey nougat. It’s Nougat November! 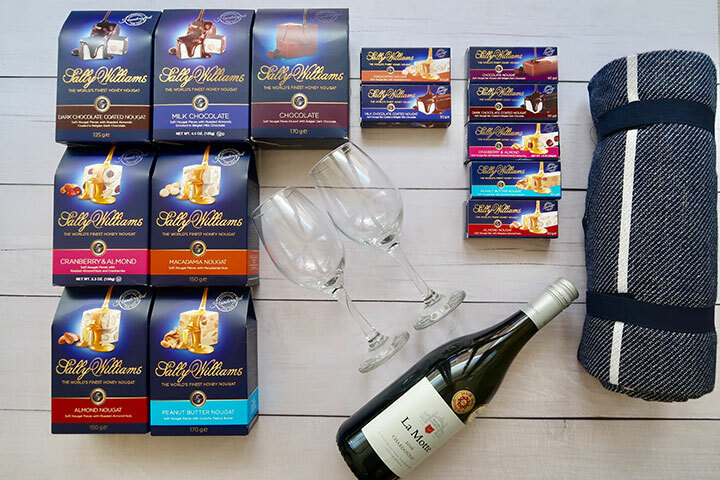 To celebrate; Sally Williams is teaming up with Food & Home and giving one lucky winner the chance to win the ultimate picnic crate filled with every flavour of Sally Williams nougat. The winner will also receive a picnic blanket, a bottle of La Motte wine and two wine glasses, because everyday indulgence is always better shared. To enter, simply complete the entry form below. Terms and conditions apply. Competition ends 30 November 2018.